Thank goodness that the Protectiva range is here to save you! 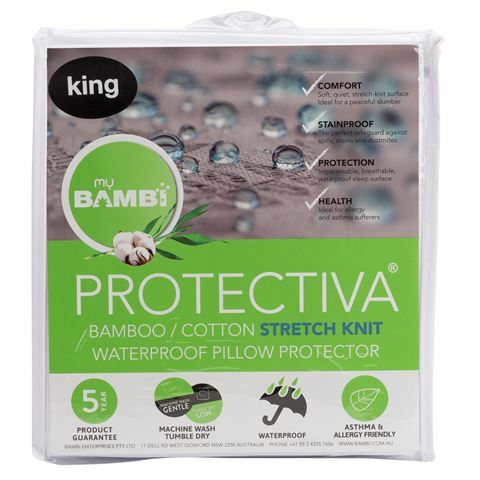 The Stretch Knit Waterproof Pillow Protector is made from a breathable cotton and bamboo blend, which is then treated to protect your pillow from dust mites, perspiration, bacteria growth, and more. Crafted from a blend of cotton and bamboo. Soft and quiet stretch knit surface. Waterproof design keeps your pillows in pristine condition. Acts as a safeguard against spills, stains and dust mites. Breathable surface for a comfortable night’s sleep. Ideal for allergy and asthma sufferers. Gentle machine wash and low tumble dry recommended. Presented in a zippered Bambi storage case.